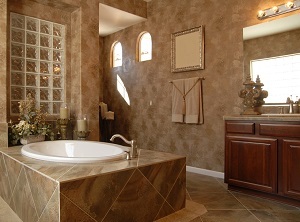 Have you ever been in a bathroom that just exudes luxurious without the slightest hint of being garish? Luxury doesn’t have to exactly mean opulent, nor does it have to mean a space that’s overly embellished with showy decorative elements. There’s something about how luxury that’s represented in clean, simplicity can make you feel really comfortable and relaxed. While too much adornment or opulence can actually make you feel stressed or anxious without you even knowing you’re feeling it. With too many ornate details, there are too many things for the eye to be attracted to, making what should be decorative turn into something like clutter in our minds. As in all things in life, a balance is necessary. In order to reach the goal of creating a luxurious feeling of relaxation in your new bathroom space, the professional Jacksonville remodeling contractor at Atlantic Total Solutions understand that you have to hit the mark between opulence and simplicity. For instance, let’s say you opted for some ornate faucets, handles, and other hardware. What’s behind these smaller fixtures needs to be smooth or solid so the ornateness of the hardware stands out. Otherwise, the beauty of the object gets blended into the background of the ornateness behind, making neither look right. In modern times, modern style options allow you many smooth surfaces that are luxurious without being overly ornate. The modern look of sleek countertops can be paired with streamlined glass mirrors and lighting fixtures on walls nearby. Shower glass is always going to be smooth, which is great because what you really want to show off is an ornate and beautiful tile work behind. That’s where texture should play, light should reflect off of, and the eye should be drawn. Not to the framework of the glass shower stall walls. Flooring should only compliment and bring out the other elements in the room, not overpower it to where that’s what you’re focusing on when you enter. 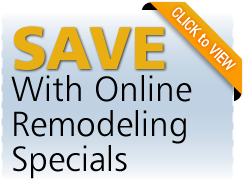 For example, let’s say you remodel your bathroom and choose a gorgeous marble floor. While there’s nothing wrong with the marble choice, you want to make sure it’s not the show stopper of the room so other elements in the room need to be more eye catching than the flooring. You want your countertops, shower surround, bathtub surround, and cabinetry to show well together with the floor complimenting the textures, style, and colors of these areas. When planning for your Jacksonville bathroom remodeling project, you create luxury by bringing in elements that make you feel relaxed. Having a space that’s too busy is going to throw you off and send your mind to the opposite direction. But with a few key elements that are eye catching and beautiful, while all is blended together, you can effectively create the luxury you’re going for. Just remember, balance is the key when it comes to your luxury bathroom remodeling! 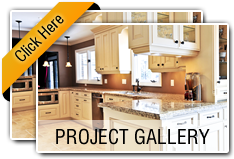 If you are looking for a Jacksonville remodeling contractor then please call 904-757-9641 or complete our online request form.